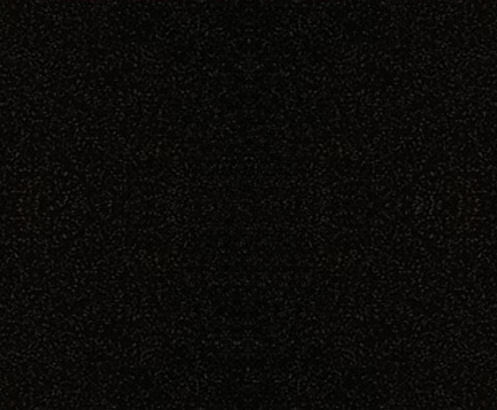 You’ll notice a few things about Masons Restaurant Bar that sets them apart from other restaurants in Manchester. They know it’s easy to be bamboozled by flowery language on restaurant menus. They’ve deliberately kept the menu simple to understand with ingredients you’ll immediately recognise. The experienced waiting staff will give you all the details of the locally sourced ingredients that make up the day’s dishes and help you make your choices. Located on the ground floor of Manchester Hall – the former Freemasons Hall, you’ll notice a few nods to the building’s past in their interior. 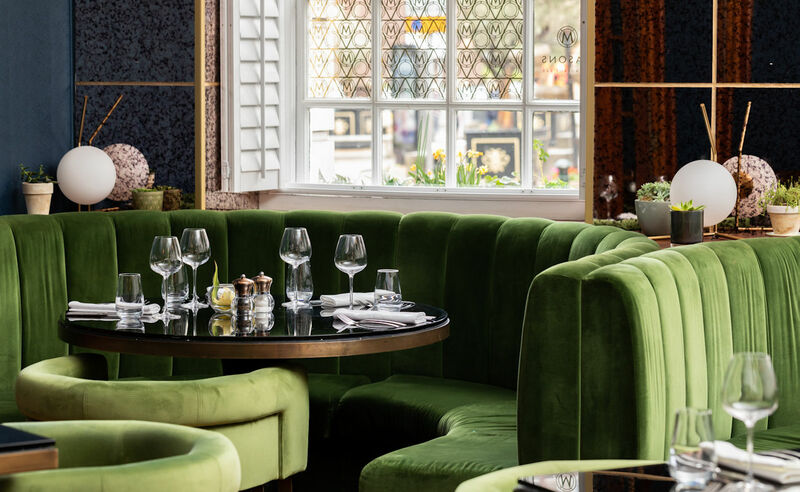 The restaurant boasts an array of different dining options under one roof, catering for a variety of occasions – from entertaining clients at lunch to enjoying a romantic evening meal. A Freemasons-inspired booth can also be booked for private dining. 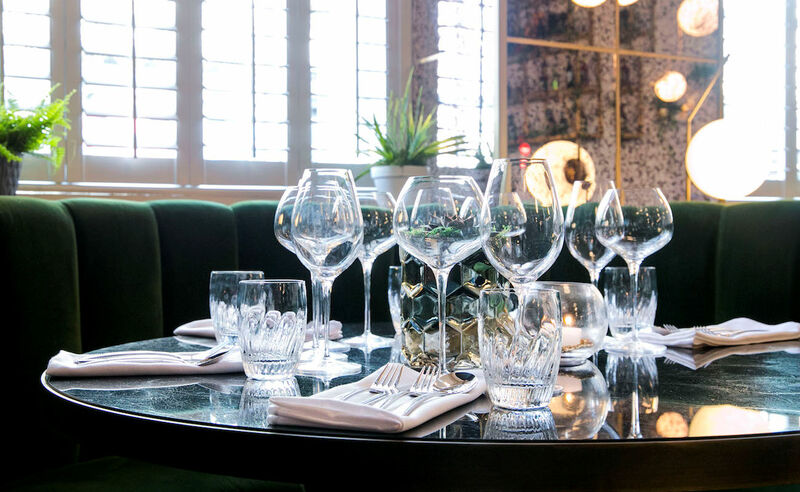 Masons is perfect for work lunches and meetings during the day, as well as being the ideal place to unwind after a stressful day in the office. The bartenders and staff are easy to spot in their smart uniforms, while you relax with friends and colleagues in plush surroundings. 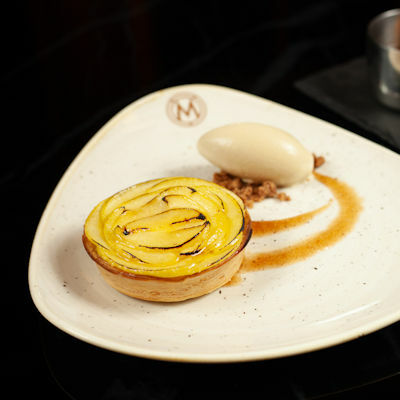 Just as the Masons’ name references the building’s unique history, the food at Masons also nods to some of Britain’s most iconic ingredients, helping to form their ‘Best of British with a modern twist’ inspired a la carte menu. 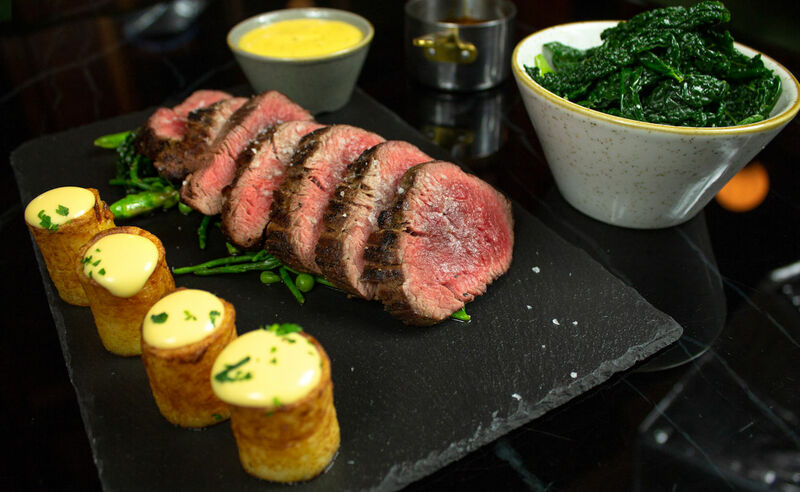 The ‘Best of British’ a la carte menu embraces the transition to warmer seasons with the freshest available ingredients. The Rump of Cheshire Lamb is served with mint polenta and wild peas, their succulent Spring Chicken (supreme) comes with Jerusalem artichokes, peas and black forest ham. Rabbit is new to the Masons menu, guests can enjoy the Rabbit Ballotine with spinach, golden raisins and sauteed cashews. Masons’ vibrant new lunch menu is full of fresh british ingredients fused with a modern twist to create a range of delicious dishes. 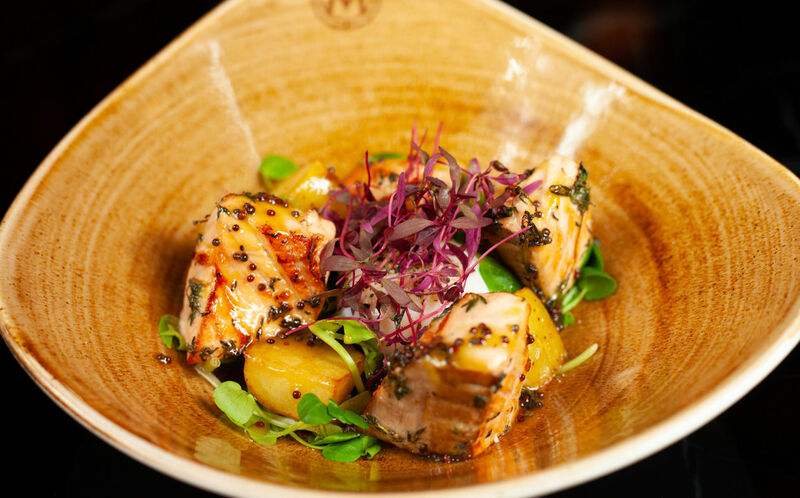 The Salmon Salad includes baby potatoes, flaked salmon, watercress, poached eggs and a warm honey & mustard dressing. The Hummus Flatbread is served with aubergine hummus, charred greens and toasted nuts perfect for vegetarians and vegans. 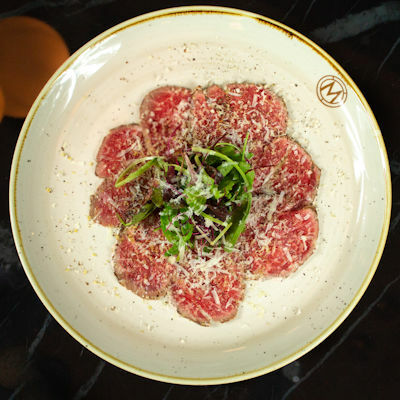 The lunch menu also includes classic favourites such as the Steak Salad with crumbled stilton and pear. 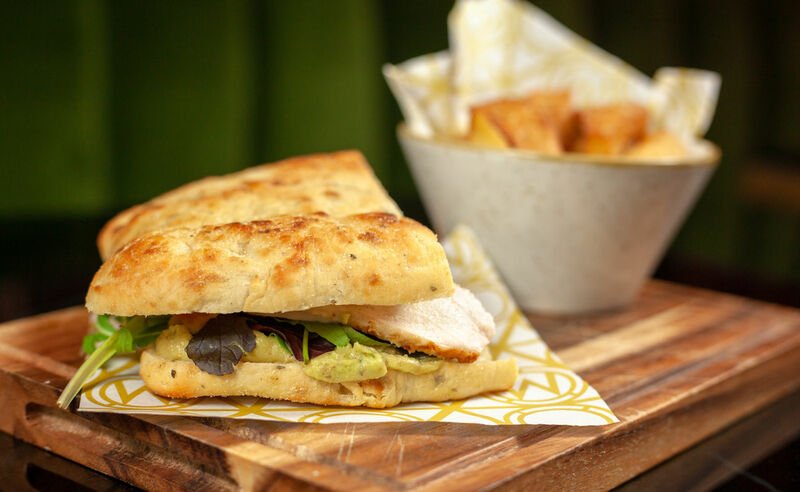 Diners can choose a more hearty option of a Chicken Sandwich with smashed avocado and tomato salsa. 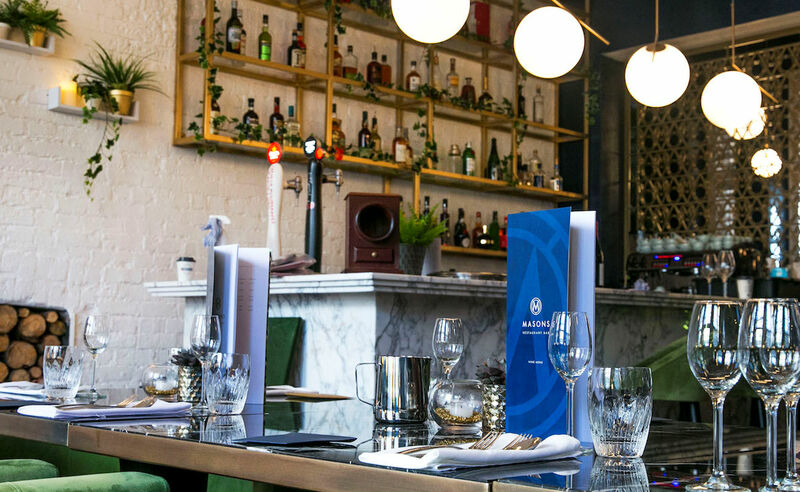 So, whether you’re visiting Masons Restaurant Bar for a client lunch meeting or winding down after a hard week at the office, you know that as soon as you enter their doors you’re in safe hands. If you're looking for a Lunch with a difference the Masons restaurant has the perfect menu for you. Enjoy 1 course from their specially created lunch menu and a soft drink, glass of wine or pint of Estrella for £9.50. Sunday calls for a roast! 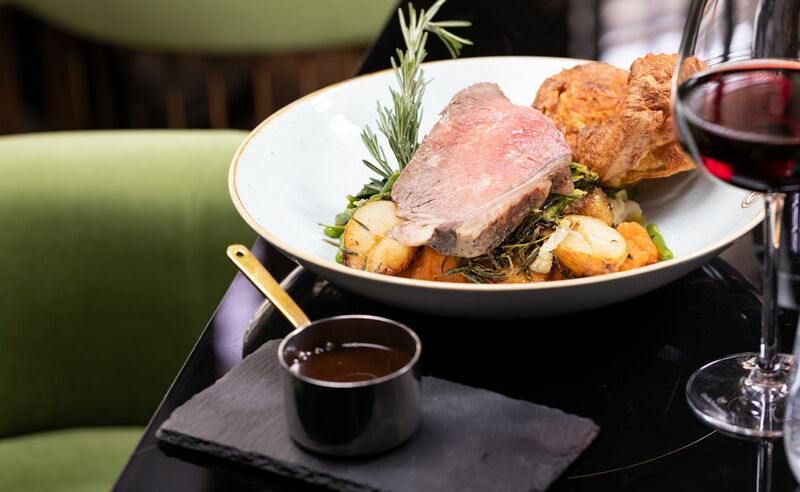 Choose from Roast Sirloin of Beef, Lemon & Thyme Roasted Chicken, Goats Cheese & Spinach Wellington or Pan cooked fennel & lemon infused fish of the day all served with Roast Potatoes, Steamed Greens, Carrot & Swede Puree, Cauliflower Cheese.